Here at Brilliance Honda of Crystal Lake, we’re always happy to offer the latest Honda Accord models. The 2017 Honda Accord Touring is a luxurious, upscale, high tech sedan that should please any drivers in the Elgin area looking for a premium family car. Find out more about what the Touring trim has to offer here at Brilliance Honda of Crystal Lake. What makes the Honda Accord Touring different from lower level trims? It includes premium features such as auto on/off LED headlights, heated front and rear seats, the Honda Satellite Linked Navigation System, and the Honda Sensing package. None of those features are standard on any other Accord model. 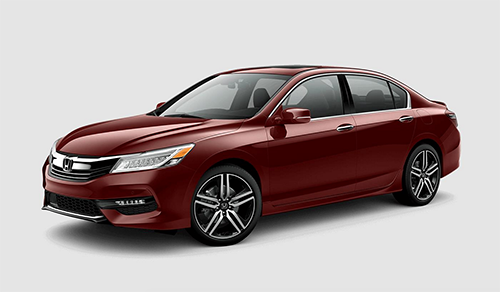 The Accord Touring uses a 3.5L V6 to deliver 278 hp and 252 lb-ft of torque. This powerful V6 manages to provide up to 21 mpg city/33 mpg highway/25 mpg combined EPA estimate with standard six-speed automatic transmission*. The 2017 Honda Accord is in stock now here at Brilliance Honda of Crystal Lake. Come drive the Accord and find out which model is right for you at 680 W. Terra Cotta Ave. in Crystal Lake. If you have any questions, feel free to contact Brilliance Honda online now.